A new guide will help parties caught up in the family justice system navigate the complicated issue of publishing judgments about private family matters. The Transparency Project's guide aims to help those dealing with cases involving privacy issues affecting children and vulnerable adults. The guide is directed at families and the professionals working with them, to help them think through the possible pros and cons, and the potential practical consequences of publication. Rather than focusing just on issues of anonymisation and jigsaw identification, it aims to involve families in the decision making process about publication, and with the process of anonymising judgments so that privacy protection is robust and effective. "We identified that there were no materials for families involved in family court cases to help them understand when, why and how judgments in their case might be published. Our guide aims to fill that gap. 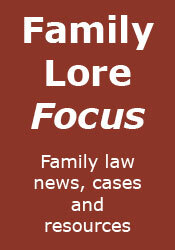 It isn't practical or appropriate for every judgment in every family court case to be published, but we hope that it will both help make sure judgments are reliably anonymised before publication, and help families and professionals to support publication where that can be achieved without jeopardising the family's privacy or welfare. We hope that our guide will be used by lawyers, social workers and children's guardians to talk through questions of publication of judgments with the children and parents they are working with, so that safe transparency can be facilitated where possible, and unnecessary anxiety avoided." Publication of Family Court Judgments - A guidance note for families & professionals, can be found at http://www.transparencyproject.org.uk/resources in pdf format. It can be used as a tool to assist parents and their lawyers to discuss and think through whether publication is likely or appropriate in their case, and if so how it should be done, and can be used by social workers or children's guardians to work through similar issues with older children, depending on their understanding and maturity.